The tilt in space mechanism allows you to independently adjust the position of the backrest and to tilt the chair backwards and forwards moving the leg rest at the same time avoiding shearing of the back and the hips. Once the leg rest is all the way down it will rise to aid in standing. The seat and back of this particular mechanism has a fixed angle that doesn’t change during the recliner movement as the seat tilts with the back as the footrest is extending allowing the user to have full and total support avoiding shearing of the back and hips. The Dual mechanism has two motors that will independently drive the back and foot rest but will still bring the chair to a near standing position. The user has total control of the exact movement to the angle of recline on the backrest and the footrest i.e. the footrest can be elevated and the back remain in an upright position. The control is totally independent of each other enabling the user to achieve their own individual position of comfort for relaxing. This mechanism has been designed and built to cope with weights of up to 70 stone and severe fluid retention. The rise/recline movement is controlled by individual motors with the seat lift having 2-motors that are synchronised to ensure user comfort and safety. All Knightsbridge recliners are available in a wide range of vinyl’s, fabrics and two tone options which allows you to pick the correct performance material for your environment. To ensure you select the right recliner for your needs, our sample delivery service allows you to evaluate the models you need for 3 weeks delivered direct to your premises or with our showvan service you can choose up to 20 models to be delivered to your premises for evaluation. 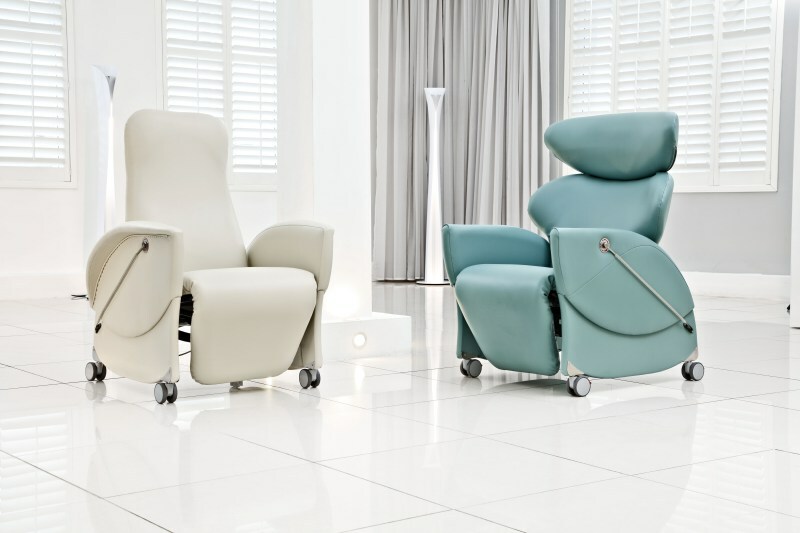 For further information on our recliner ranges or to book a sample evaluation contact our team today on +44(0)1274 731900 or email enquiries@knightsbridge-furniture.co.uk .